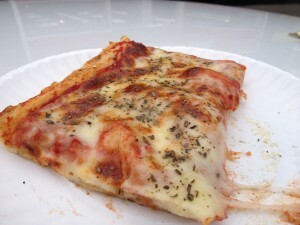 Every time I drive by Leone’s on Broadway, I think, I should stop and try a slice of their Sicilian pizza. It is a small pizza and sub shop, all take out and delivery. I’ve read raves about it on Seriouseats.com and my friend Billy also recommended I try it(although, I think he likes them for their subs). So, when I spied a parking space, right in front, I decided it was fate. Apparently at lunch, they offer half a dozen varieties, but when I strolled in at 5:30pm, there was only half a tray of cheese slices available. I asked for a corner piece and had them heat it up for me. It was good, not great. The dough was soft and pillowy, but with a decent chew. The sauce was zesty with herbs and the cheese was nondescript. For $2, it’s a good sized slice and 2 pieces would definitely fill you up. Miccuci’s in Portland, Maine still has the best Sicilian pizza I’ve ever had, but this isn’t a bad option if you are in the area.